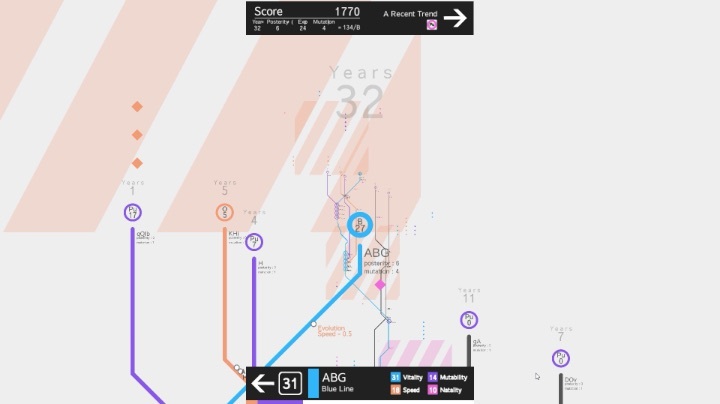 MetroTree is a strangely addictive little game where you attempt to create as large a metro system as possible before your health runs out. In MetroTree you control a metro line, using the left and right mouse buttons to move it left and right on the screen. There are lots of colored pellets to collect which increase your health and can also increase your stats. You have four stats in total – Vitality (increases max HP and strength), Speed (increases Speed), Mutability (Increases chances of stat increases), Natality (increases the chances of spawning child lines). You gain points for the number of years you go on for, the length you cover, the length of your child lines and the number of mutations you achieve. You have to keep on collecting those colored pellets though – if you run out of health then it’s game over. MetroTree really impresses with it’s striking Metro Map styled visuals, addictive high score-chasing gameplay and groovy dance soundtrack. It’s great fun seeing how far your little metro tree can grow and there’s even an online leaderboard to try and conquer. Highly recommended.